SO now the headline has your attention, here’s the story. 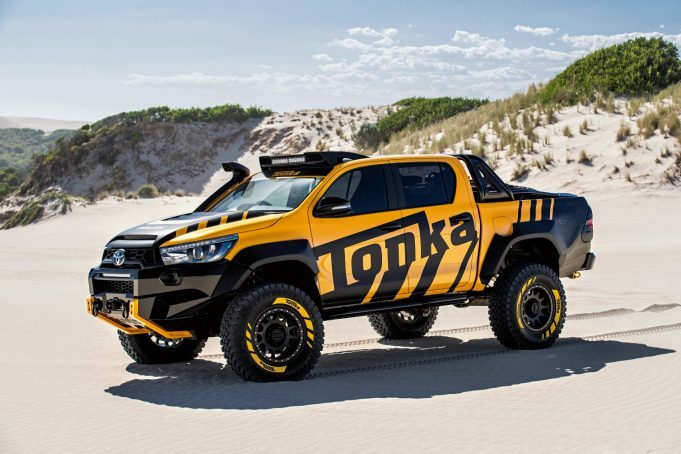 Toyota is rekindling childhood memories with the reveal of a stunning concept vehicle that brings together the iconic Tonka and “unbreakable” HiLux brands. An extensive makeover starts with significantly more ground clearance – an increase in ride height of 150mm (6 inches). Combined with a high-riding axle, heavy-duty suspension and 35-inch diameter tyres, the HiLux Tonka Concept is equipped to power over rugged terrain that would be off-limits to other off-roaders. A new front bar is compatible with the vehicle’s safety systems while the bonnet has a carbon-fibre skin and features an aggressive “power bulge” and air scoops. High-performance off-road LED lighting in the bar and roof pod combine to provide excellent night vision for off-road trails. A rugged bash plate made from 6mm-thick alloy is designed to protect the sump and other vital components. Tubular side rails protect the body and chassis. Inside the tub, a removable tubular frame keeps all the gear in place, including diesel fuel cans, while storage boxes house the recovery gear needed for extreme off-road driving. A fire extinguisher, axe, shovel and high-lift jack are also fitted. Tonka is a household name, celebrating its 70th anniversary this year. Equally renowned, Toyota is in its 80th year of incorporation. Since HiLux was first launched in 1968 it has earned and reinforced its reputation for being “unbreakable” – and for being popular. It was conceived, designed, assembled and tested by designers and engineers from Toyota Australia’s 150-strong product planning and development division. While the HiLux Tonka Concept is not destined for dealer showrooms, adults and kids alike will have the opportunity to share the dream as it tours 4WD shows, field days and expos around the country. Toyota has unveiled two fuel-cell concept vehicles - a premium six-seat sedan-styled vehicle and a 79-seat bus - both of which use hydrogen as the primary energy source.